Geometric shaping combined with bands of lace and a cabled edging creates a balance of structure and femininity. Errata states that yardage in book is incorrect. 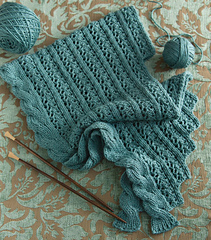 Pattern requires 3 skeins of Venezia.